The diagnosis of ADHD has been getting a lot of media attention lately over concerns about possible overdiagnosis and overtreatment. A recent study from the CDC’s National Survey of Children’s Health now provides important national statistics regarding the prevalence of ADHD, as reported by parents, and the trends over time. Reports from this survey previously found an increase of 22% from 2003 to 2007 with an overall rate of 9.5%. 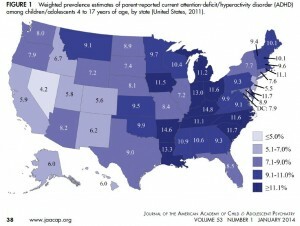 At that time, 4.8% of U.S children and adolescents were taking an ADHD medication. This new study provides information up to 2011. The data come from a random-digit-dialed telephone survey of parents that was performed in over 75,000 households using both land lines and mobile phones. Parents were asked about lifetime and current diagnosis of one of their children as well as about severity, age of onset, and treatment. The overall response rate was 23.0%. Analyses were weighted to estimate a total prevalence. Overall, the rate of ever having ADHD among 4 to 17 year olds nationally was 11% (15.1% for boys, 6.7% for girls), representing 6.4 million children. This rate represents an increase of 42% from 2003 to 2011. Of those will current ADHD, 69% were taking medication for it resulting in an overall medication rate of 6.1%, and increase of 28% from 2007. About half of children with current ADHD were engaged in some kind of counseling. There was substantial variation in diagnosis rates and medication treatment between the states with several southern states, such as Arkansas and Kentucky among the highest. The rate in Vermont was 9.4% which was slightly below the national average and a bit lower than neighboring states (with the exception of New York at 7.7%). These rates compare to 6.9% in 2003 and 9.9% in 2007 (from the prior CDC report), suggesting that unlike other states, the prevalence in Vermont has not increased from 2007 and may actually be going the other direction. The 2011 Vermont medication rate was 6.6% which is just above the national average. Thus, compared to other states, a higher proportion of those diagnosed with ADHD in Vermont are receiving medication treatment. The authors of the study concluded that there has been a substantial rise in ADHD diagnosis over the past decade with approximately 2 million more children and adolescents receiving the diagnosis now, and most taking medications for it. This increase, they state, is resulting in an additional burden on the health care system, although the authors don’t do any kind of economic analysis of the costs related to untreated ADHD. This paper comes soon after a very similar report by McDonald and Jalbert in Psychiatric Times that was previous a topic of this blog. In that study, the rate of stimulant treatment, using a prescription database, was 2% with Vermont being 34th in the nation. It is difficult to know exactly how to reconcile these two studies. While providing very useful information regarding overall statistics, trends, and state differences, it is important to remember that the study has no information regarding the accuracy or appropriateness of the diagnosis or treatment. Thus, you can expect different people to use these numbers to make different conclusions. A group here is currently working on some data regarding antipsychotic medications among Vermont prescribers that will shed more light on this important topic. Visser et al., Trends in the Parent-Report of Health Care Provider-Diagnosed and Medicated Attention-Deficit/Hyperactivity Disorder: United States, 2003–2011. JAACAP 2014;53:34-46. This entry was posted on Wednesday, March 5th, 2014 at 12:08 pm and is filed under ADHD, Medications, Public Policy. You can follow any responses to this entry through the RSS 2.0 feed. You can leave a response, or trackback from your own site.